Alanase Nasal Spray (Beclomethasone Dipropionate) contains an active ingredient which is a type of corticosteroid. These medicines work by preventing substances which cause inflammation from being released. Doctors commonly prescribe this medicine for treating or preventing hay fever, perennial allergic rhinitis (a condition which can be triggered by allergies to pets or other allergens), and another condition known as vasomotor rhinitis (inflammation of the lining of the nose which is not caused by an infection or allergy). Alanase Nasal Spray (Beclomethasone Dipropionate) contains an active ingredient which is a type of corticosteroid. These medicines work by preventing substances which cause inflammation from being released. Doctors commonly prescribe this medicine for treating or preventing hay fever, perennial allergic rhinitis (a condition which can be triggered by allergies to pets or other allergens), and another condition known as vasomotor rhinitis (inflammation of the lining of the nose which is not caused by an infection or allergy). This nasal spray can help to relieve discomfort in the sinus, a blocked or runny nose, sneezing and other allergy symptoms. 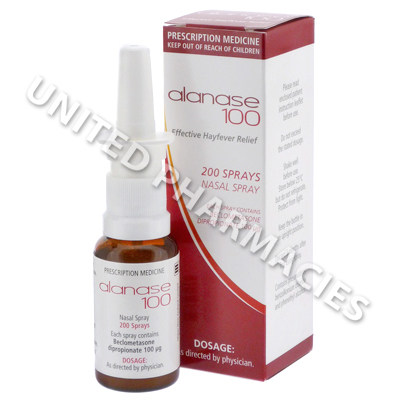 Alanase Nasal Spray (Beclomethasone Dipropionate) is administered directly to the nose, exactly as instructed by your doctor. If you are not fully sure about the correct application procedure, ask the prescribing doctor and read the instructions provided with the product. Patients are sometimes instructed by their doctor to inhale it 2 to 4 times per day (the exact amount of sprays will be decided by your doctor). You will need to consult your doctor immediately if you notice blurred vision, pain affecting the eyes, fever, nosebleeds that are severe, breathing difficulties or any other symptoms of a severe reaction. You must notify your doctor before using this medicine if you are currently affected by or have ever suffered from ulcers, seizures, a condition known as myasthenia gravis, diseases affecting the kidneys, liver, intestines or heart, diabetes, hypertension, any mental illnesses, a herpes infection of the eye or osteoporosis. This medicine may not be suitable if the patient has an infection of the nose or a fungal infection (except if the infection occurs on the skin). Always use Alanase Nasal Spray (Beclomethasone Dipropionate) as you have been prescribed by your doctor. Never self-medicate or change your dosage without first consulting your doctor. The correct dosage can vary depending on your health, medical history, and the severity of the condition being treated.